Fabulous values..buy properties now before prices increase again! Imagine a place where time stands still and the brush of waves against the shore is the only sound for miles. Where loggerhead sea turtles nest among dunes while visitors bask on white sand. Where cypress marshes and freshwater lakes are framed by the shade of century-old live oaks. This place exists. And it's closer than you think. It's South Walton Beaches in Northwest Florida's panhandle. While it may be tempting to spend all of your time stretched out on the clean, sugar white beaches, what lies beyond the dunes is just as treasured by visitors. South Walton's 13 beach communities are recognized for their pristine, unspoiled beauty. Approximately 40 percent of South Walton's 56,000 acres is owned by the State of Florida and thus is protected from future development. That's an amazing 25,000 acres of untouched property where native wildlife such as deer and fox and endangered species like the Gopher Tortoise and the Red Cockaded Woodpecker call home. This easygoing region celebrates a richly diverse palette of art and culture. That's because people of many interests live side by side, their traditions merging to create an artistic community of neighborhoods that offer incredible energy and fascinating contrasts. So take a stroll down the winding streets of Rosemary Beach and get a feel for the neighborhood and local lore. Or peruse the galleries throughout the area -- from funk to fine art - and then take in a festival. This delightful series of hamlets offers everything from historic main avenues and relic railroads to artsy urban street painting and indulgent wine tastings. Walton County is an anomaly along the Panhandle's Highway 98, a demure sigh between the exciting amusements of Panama City Beach, Destin and Fort Walton Beach. It remained relatively undeveloped for many years. But recently posh, progressive housing and resort developments have sprung up alongside the natural wilderness. Even with all the new development, however, the beaches along South Walton County will remain largely state-owned and preserved in their natural state of sand pine forest, freshwater lakes, emerald green Gulf waters, and those knock-out, snow-white sand dune beaches. Serious development began with the town of Seaside, a wildly successful experiment in “new urbanism” that has caused social and architectural tremors since its inception in 1981. The stage set for the movie The Truman Show, it mirrors the perfection of its portrayal with hometown, pedestrian-friendly streets, pastel residential and rental cottages and palaces of Victorian style framed in picket fences, art galleries, an outdoor market, pleasant restaurants, recreation and easily accessible beach. Sitting at Panama City Beach’s doorstep, Seaside couldn’t be further away in ideals. And from its cues, the coastline develops in a tone that combines Southern manners with beachside creativity. Rosemary Beach, nearby, follows the same successful blueprint developed by Seaside but instead of Seaside's patent look, Rosemary Beach has gone with a blend of colonial St. Augustine, New Orleans and West Indian styles in natural tones. Like Seaside, it offers vacation rentals to short-term visitors. WaterColor and Alys Beach are the latest to follow this pattern with distinctive style. Heading westward, a continuum of beach communities ranges from the state’s oldest beach town, Grayton Beach, to the modern, full-service golf and marina resort of Sandestin. Laced through the 26-mile stretch, parks and preserves provide opportunities for recreation on land and sea, excellent restaurants sharpen the edge on local cuisine, and shopping is unexpectedly varied – from quaint garden shops and antique boutiques to the hautest of couture. Rent a furnished condominium or steal away to a charming bed and breakfast: your perfect getaway awaits you. Grayton Beach is known for its artists’ community, which evolved from its hippie days. Nearby Grayton Beach State Park was named America’s best beach by coastal geomorphologist Stephen Leatherman, a.k.a. Dr. Beach in 1994. Other area parks include Topsail Hill Preserve State Park, named for its towering dune, and Deer Lake State Park, where you can gaze at the dense range of sand mountains and valleys. Monarch butterflies invade the parks and places of South Walton County every fall en route to migration’s end in Mexico. Festivals erupt upon their serendipitous arrival. Sandestin Golf and Beach Resort has carved its own town out of the coastline. Hotels and condominiums accommodate visitors on the beach, at the marina, near the tennis courts, and around its four championship golf courses. Like a town, it offers shopping centers and restaurants of vast variety. Marina-side, it owes greatly to the area’s sailing reputation with a rental fleet and classes for kids. Beautiful Choctawatchee Bay and River lure watersports enthusiasts of every ilk, from anglers and bird-watchers to kayakers and jet-skiers. Overlooking the bay is Sandestin’s new Village of Baytowne Wharf, which features specialty shops, restaurants and nightclubs. To further escape the 21st century, head north to the Victorian heart of DeFuniak Springs. Home in the 1880s to the humanities-focused Florida Chautauqua Festival, an offshoot of New York’s chapter, it retains an air of cultural sophistication in its handsome historic lakeside district of frilly homes and antiques shops. The Chautauqua has been resurrected in recent years, held in February and March. And although Interstate 10 passes by its door, the town remains a picture of the past with more than 150 buildings listed on the National Historic Register. Visit its winery near the interstate or take the short drive to Ponce de Leon Springs State Park, a genteel oaks-shaded park where families cool off in the springs-climatized (constant 68 degrees) swimming hole and picnic along its banks. This peaceful beach town is tucked between the coast's natural dunes, among oak, pine, magnolia, hickory and holly trees. Back in the 1940s and 1950s, families came to Seagrove Beach to rent modest one-story cottages with paddle fans instead of air conditioning and wide screened porches (perfect for sleeping).The same families returned year after year, and now second and third generations make the journey. Many of those cottages still exist, although they've been updated for today's travelers and are now thoroughly shaded by mature scrub trees and plants. Swimming and sandcastle building were once the popular pastimes, since there weren't many commercial ventures in the Seagrove area. Now visitors have numerous options for recreation as well as dining. Just up the road are art galleries and antique stores. Eastern and Deer Lakes make wonderful spots for quiet reflection, or put in a canoe or kayak for a day of exploration around the Seagrove Beach area. 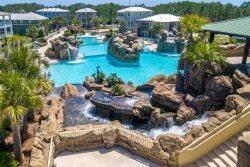 Characterized by picturesque coastal residential enclaves, thriving commercial enterprises and miles of breathtaking beaches, Santa Rosa Beach is one of the 13 unique communities located in the Beaches of South Walton. Visitors will discover a variety of offerings here, from championship golf and water sports to fine dining and stunning uncrowded beaches. The area is home to superb shopping and luxurious accommodations as well. Santa Rosa Beach is a beautiful oceanfront community with charming restaurants and cottages nestled in sea grass and susceptible to the gentle sounds of waves cresting on the shore. Santa Rosa is a perfect vacation spot for outdoor enthusiasts or those looking for a relaxing escape from the big-city stress. Seaside made a giant splash in the architectural world when developer Robert Davis carved out a modern Victorian town with narrow streets, picket fences and homes arranged close together to encourage walking-and neighborliness. It was the first of its kind, creating the model for towns across America. Seaside's "walk-to-anywhere" design is working to bring necessary shops and services to its residents and guests, including a post office and a school. Seaside's centerpiece contains the market, art galleries, a florist, an ice cream store, a post office, and other small boutiques. Find many artists-in-residence at galleries lining Ruskin Place. Although many of the homes can be rented on a daily or weekly basis, Seaside also offers a motor court and bed and breakfast. Park your car and rent bicycles to explore this wildly successful pioneering town, featured in the 1997 motion picture "The Truman Show." The sand on Destin & South Walton's beaches is extremely fine. This is due to the enormous amount of travel the sand went through to reach its destination. The sand along Beaches of Destin & South Walton was once part of the southern Appalachian Mountains. Over millions of years, as the mountains weathered, particles of quartz were washed into riverbeds and transported by the river to the ocean. The flow and ebb of the water over this long distance broke down the particles and buffed the edges making them as fine as sugar when they finally rested along the shore in the area. The Gulf of Mexico along the beaches of Destin & South Walton is so clear because no large, sediment-heavy rivers directly influence the waters. The water coming out of the Apalachicola River, the primary source of our Gulf water, is filtered through the estuary of Apalachicola Bay. While passing through this bay and out past the barrier islands in that area, the Gulf water deposits most of the silt and other sediments, that for example, make the Atlantic less translucent. The Gulf water along the beaches of Destin & South Walton appears aqua green because of the purity and hence crystal clarity of the water. The shallowness of the Gulf and the high reflectivity of light off our sugar-white sands also help to create our beautiful translucent water. Fine as sugar, white as snow, green as emerald and blue as aquamarine. These phrases are often used to describe the sand and water along our shoreline. This shoreline consists of pristine dunes, wildlife and vegetation not found in many of today's coastal environments. In addition to the sugar-white sand, aqua waters and unspoiled sand dunes, you will find beautiful nature trails and a safe, crowd free environment. Topsail Hill State Preserve, one of South Walton's five state parks, is a three-mile span of undeveloped beachfront property that has been identified as the most pristine and environmentally protected piece of coastal property in Florida. Topsail Hill State Preserve has been named in Attaché magazine as one of the "Great Wilderness Beaches." Read more about area parks. Birmingham magazine recognized ArtsQuest as the "Best Arts Festival" and the magazine also gave Sandestin Golf & Beach Resort the distinction of the "Best Family-Friendly Destination." In 2002, Florida Trend magazine gave the Golden Spoon Award to Criolla's restaurant for the 14th consecutive year. Florida Trend also recognized the Sandestin Hilton's Seagar's restaurant as one of the top 200 new restaurants in the state. State parks and miles of nature trails are perfect for those who prefer hiking and biking over swimming and sunbathing. Dunes, pine flatwoods and salt marshes provide a safe haven for an abundance of plants, birds and other wildlife, including several endangered and threatened species. Nature trails at Grayton Beach State Park, Topsail Hill State Preserve, and Point Washington State Forest offer wonderful opportunities to observe flora and fauna. South Walton is home to 17 fresh and saltwater lakes as well as the Choctawhatchee Bay. These waters are a haven for fishermen and kayakers. When you hear the word "beach" you think of summer. And, naturally, summer is the peak season along Destin & South Walton. However, fall and winter are quickly becoming popular due to the many "perks" this time of year offers. Rates drop, sunsets are spectacular, temperatures are mild, crowds are few, and festivals are plentiful. Destin & South Walton offer championship golf concentrated along a 12-mile stretch of the Gulf of Mexico, including Sandestin's Burnt Pine Golf Club, Links, and Baytowne -- all named as Golf Digest's "Best Places to Play." Sandestin opened its fourth course, The Raven Golf Course, in 2000 and it has already been voted best new course in the state. Tennis is also a popular sport with hundreds of courts open to the public. Whether you are a tennis pro or just learning the game, you'll find all levels of play available on hard, clay, and even the only Wimbledon-style grass courts in North Florida. It wouldn't be the beach without water sports and visitors to Destin & South Walton can find plenty of ways to "get their feet wet." Home to the Gulf of Mexico, 17 fresh and saltwater lakes, and the Choctawhatchee Bay, visitors can enjoy fishing, boating, kayaking, snorkeling, scuba diving and, of course, sunbathing. Shopping and dining have become art forms in Destin & South Walton. You will find everything from quaint antique shops along the South Walton Antique Trail to the largest designer factory outlet center in the nation. You won't want to miss Seaside's open-air market and artists colony or the many shops that are part of The Market at Sandestin. Art galleries are also plentiful throughout the area. See our guide to area shopping. After a day of shopping, nothing is better than a great meal. Destin & South Walton are home to over one hundred restaurants offering everything from fresh Gulf seafood to Caribbean Creole cuisine. (And since you're in the south, you can also expect to eat some of the best Southern-style cooking you have ever had.) Seven of Florida Trends' top 200 restaurants in the state are located in South Walton including Bud & Alley's, Café Thirty-A, and Seagar's. We are also proud to be the home of Criolla's restaurant, voted one of the top 400 restaurants in the world by Wine Spectator. See our area dining guide. South Walton offers visitors the opportunity to explore turn-of-thecentury Florida Panhandle architecture amidst the beautiful grounds of Eden State Gardens and the Wesley Mansion in Point Washington -- one of the first towns established in the area. Visitors can also tour the 100-year-old community of Grayton Beach characterized by wooden houses made of weathered cypress and bordered by sand streets and an abundance of trees. The natives are friendly so make yourself at home. Destin Commons - for all your shopping needs!